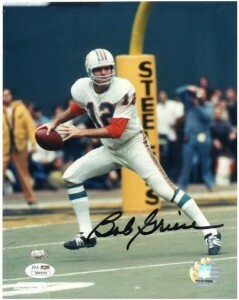 Bob Griese football cards and autographed memorabilia are key to any Miami Dolphins team collection. He was the leader of the 1972 Dolphins team that went undefeated with a 17-0 record. The six-time Pro Bowl selection led the Dolphins to three consecutive Super Bowl appearances with the team emerging victorious in 1973 and 1974. 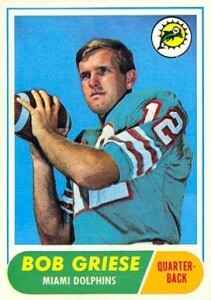 The Bob Griese rookie card is from the 1968 Topps Football set. His other early issue cards include 1967 Royal Castle and 1968 Champion Corn Flakes. The Royal Castle card is a pre-rookie release and was distributed by the restaurant chain in Florida. It is a short print and very tough to find. 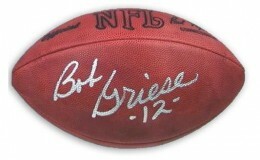 Griese's first certified autograph card was issued by Goal Line in 1989 as part of their Hall of Fame Art card set. Two of his most popular autographed cards are can be found in 1997 SP Authentic. His first game-used memorabilia cards were produced in 2000 by Donruss/Playoff. They were included in several brands that year. 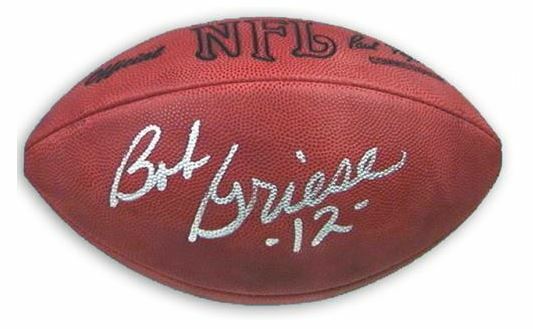 Values for Bob Griese's autographed memorabilia have remained strong through the years. Demand is consistent and supply is ample. Items related to the Dolphins undefeated season of 1972-73 carry a premium. He is a willing in-person signer and does participate in organized autograph signing events. 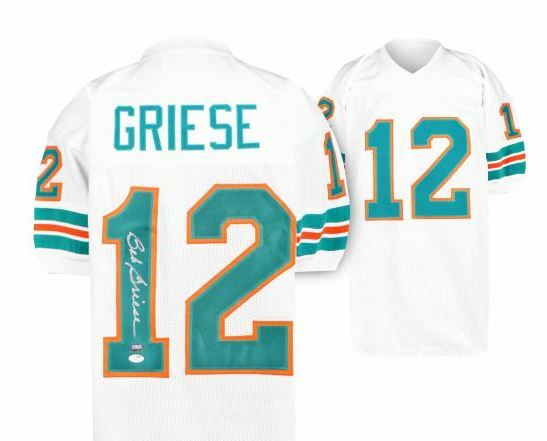 Featuring a clean design and large photograph, Griese's rookie card is highly collectible. Professionally graded samples receiving a high grade carry a significant premium. 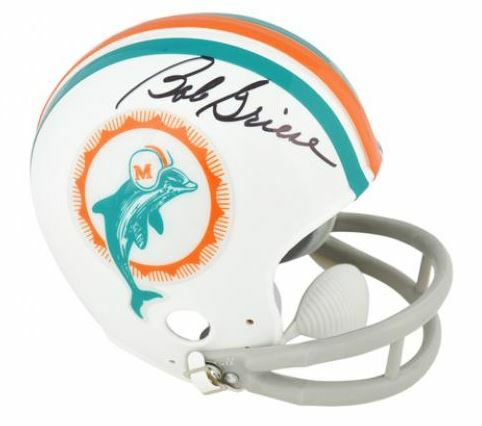 Below you will find examples of what an authentic Bob Griese autograph looks like. This can be used as a first point of reference for determining the legitimacy of autograph memorabilia, but is not a substitute for having your items authenticated by a well-respected professional autograph authentication company. Some of the trusted sources within the sports memorabilia market include the following companies: PSA, JSA, Steiner, Tristar and Mounted Memories. Click on any of the images below to view full size photos. It is a very legible and even handed signature written on an even horizontal plane with a pride of penmanship. The signature is written in cursive on a slight right-leaning angle. The "B" displays a larger bottom loop than the top one. The "o" is present and depending on the writing instrument is sometimes open looped. The "b" flows into the capital "G," whose point in the center of the signature is level with that of the "r" next to it. The remaining letters are small but discernible. 2018 Panini Select Football Bob Griese #SP-BG Gold Auto Prizm 2 5 SP!! !